But this is about the Republican Party. 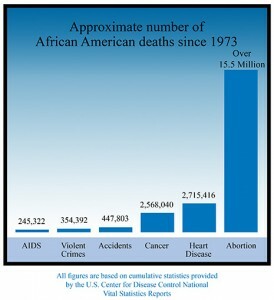 The Republicans never make black abortion their number one issue. Like most large organizations, it can do many things (immigration, taxes, spending, defense, Supreme Court vacancies, logrolling) at once, but not well. To do one thing well, Republicans have to focus. They should focus on black abortion. “Non-Hispanic white women account for 36% of abortions, non-Hispanic black women for 30%, Hispanic women for 25% and women of other races for 9%.” Blacks make up just over 12% of U.S. population, so this is a radical over-representation. “Black women continue to have the highest abortion rate of any ethnic group, with a gruesome 483 abortions for every 1,000 live births.” Read the whole thing, especially the Sanger quotes. Evil. And an informative video at abort73.com. This issue is ripe for leadership from a sincere pro-life politician of any race. Until Republicans start making this their number one priority (which, incidentally, swamps terrorism in significance), Christians should withhold their support of any candidate who does not make this the number one issue.